[vc_row][vc_column][vc_column_text]The car lights technology is now entering an entire new era with such innovations and customization options that corresponds to almost every part of your vehicle. With the arrival of the new Custom LED Door Projectors Courtesy Logo Lights, you’ll make a statement before you get out of your vehicle. No need to worry about those puddles any more, or any of the unwanted packages that are waiting to greet you there. With the Custom LED Door Projectors, you can now chose the way your projections be by customizing the logo that will be projected by your vehicle door projector. Why Mr. Kustom Door LED Projector ? With a powerful 7w LED CREE bulb, the door projector will catch a lot of eyes while projecting your favorite logo on any floor surface at night. Sound like too much for the eye candy! The package includes 2 LED Door Projectors with 1 installation tool. 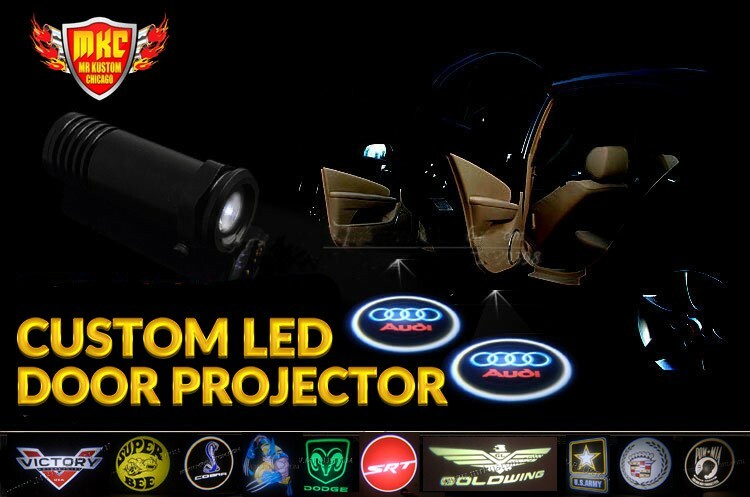 These custom projectors are meant to be mounted underneath your car’s door, however these Custom LED Door Projector Courtesy Puddle Logo Lights can be used in a number of ways, from accenting your engine bay, to foot well applications. This can be easily installed using your vehicle’s 12 volt door switch or dome light wiring, so there is no need to provide any external power sources. Now that’s power efficient! Simply select a logo from our website, or if you have got that flare for design, come up with your own set of visuals and upload it now and we’ll make it come to life with the premium quality, industry best custom LED door projections. There are other suppliers for the Door projector LEDs as well, but what you find at Mr. Kustom is a much brighter illumination projecting vivacious and lively logos or any of your custom artwork. For its price, it’s the best value for money with us. Special discounts are available for businesses, clubs and organizations with bulk orders (10 or more). You can call us at 773-583-3770 for more details on these discount offers. The Custom LED Door Projectors Courtesy Logo Lights are quality certified with no compromise on the final product. Can u make a set with my logo? This LDE lamp is very creative. Please email us at sales@mrkustom.com we can do the customized logo for your kia.